Model Name: Lange 1 Tourbillon "Homage to F.A. Lange"
Accessories: Accompanied by A. Lange & Söhne Garantie and service booklet stamped by Kuwait retailer Morad Yousuf Behbehani and dated April 15, 2011, product literature, leather wallet, fitted presentation box and outer packaging. The present timepiece is part of the trilogy of watches released by A. Lange & Söhne in 2010 to commemorate their founder Ferdinand Adolf Lange. A limited edition of 150 pieces, the present watch is number 68 of the series. It is apparent to the beholder that the material employed for the case shines with a very unusual hue. Indeed, it is the new alloy “honey gold” developed by Lange which, beyond its enthralling color, also boasts increased hardness - and thus resistance to scratching - than the usual 18K gold alloy. The same material is used in other parts of the watch such as the hands and, most notably, the bridges of the movement as noticeable through the glazed back. Further underlining the prestige of this limited edition, even the exquisitely decorated dial is made out of solid gold. 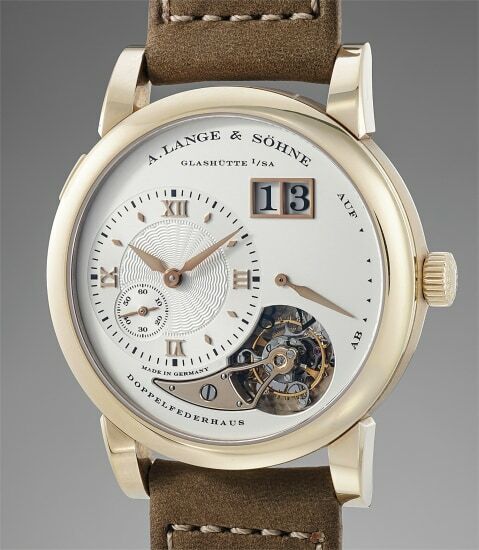 The sheen of the honey gold alloy is shaped into a quintessential Lange model: the Lange 1. With its deceptively simple-looking, but in fact highly complex case - as noticeable when looking at the bevels of the lugs - the watch exudes class, strength and style in absolute Teutonic fashion. The architecture of the movement itself employs the typical Saxonian 3/4 plate, decorated with the telltale undulating Lange décor, and boasts a mind-blowing total of 51 jewels: 49 rubies and 2 diamond. By comparison, some grand complication Swiss movements feature a similar amount of jewels to that reserved for this tourbillon wristwatch: this highlights the absolutely undisputed level of quality and finish Lange reserved for these exceptional timepieces. Originally founded in 1845 by Ferdinand Adolph Lange in Glashütte, Dresden, Germany, the firm established an entire watchmaking culture and industry in Glashütte. The brand quickly became Germany's finest watchmaker, first creating dependable, easy-to-repair watches before going on to produce some of the world's finest complicated pocket watches, including Grande Sonnerie watches, tourbillon watches and Grande Complications. On the final day of World War II, their factories were destroyed by Russian bombers, and in 1948 the brand was confiscated by the Soviet Union. Following the fall of the Berlin Wall in 1990, Ferdinand's great grandson Walter Lange re-established the brand with the objective to once again produce top-quality luxury watches. Now part of the Richemont Group, its original vintage and modern creations are highly coveted by collectors. Key models from the modern era include the Lange 1, Pour Le Mérite Tourbillon and the Zeitwerk.